Alverstone Autos - About Us! Established in March 2002, Alverstone Autos started out as a small workshop in East Worthing and has grown to become one of the best loved garages in the area. We're recognised for our honesty, reliability and quality of customer care. We offer a full range of workshop services including MOT services, diagnostics, air-conditioning, DPF services, vehicle remapping and servicing. We take pride in our friendly but professional business manner which keeps our customers returning to us regularly and recommending us to others. We are always happy to answer our customer's queries and with many year's experience as a trading garage we are confident that in most instances we will be able to resolve your vehicle problems first time. We're experts in being able to provide a real quality service at reasonable prices, we also frequently run special offers that our customers enjoy taking advantage of. No matter what the make or model, our highly trained technicians will give your vehicle the care it needs to stay in the best possible condition. Testimonials are curated by Alverstone Autos Ltd and are not independently reviewed or verified. 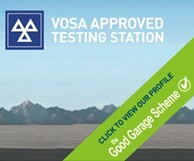 "Very friendly and honest garage. Highly recommend."